Pain treatment often includes education about the pathoanatomical model which emphasizes pain resulting from tissue pathology. The model can be accurate in cases of acute pain, but it impedes progress, elevates anxiety, and increases fear of movement in the chronic pain population; therefore, methods of education that de-emphasize tissue damage need to be implemented. This case illustrates both disability driven by fear of movement resulting from a pathoanatomical explanation of pain and return to function following 9 treatments over 6 months. Treatment included manual therapy and incorporation of Therapuetic Neuroscience Education (TNE). Quantified improvements of 16 points in the Oswestry Disability Index (ODI), 19 points on the Fear Avoidance Belief Questionnaire Physical Assessment(FABQ-PA), and 25 points on the Neck Disability Index (NDI) occurred following treatment. Implementing TNE in conjunction with manual therapy in this case resulted in a significant decrease in disability related to the low back and neck pain and fear related to movement. 3. Flor H, Braun C, Elbert T, Birbaumer N. Extensive reorganization of primary somatosensory cortex in chronic back pain patients. Neurosci Lett 1997;224(1):5-8. 7. Lotze M, Moseley GL. Role of distorted body image in pain. Curr Rheumatol Rep 2007;9(6):488-496. 11. Koltzenburg M, Wall PD, McMahon SB. Does the right side know what the left is doing? Trends Neurosci 1999;22(3):122-127. 23. Moseley GL, Nicholas MK, Hodges PW. 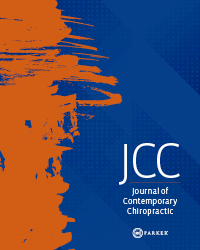 A randomized controlled trial of intensive neurophysiology education in chronic low back pain. Clin J Pain 2004;20(5):324-330. 24. Koes BW, van Tulder MW, van der Windt WM, Bouter LM. The efficacy of back schools: a review of randomized clinical trials. J Clin Epidemiol 1994;47(8):851-862. 26. Cohen JE, Goel V, Frank JW, Bombardier C, Peloso P, Guillemin F. Group education interventions for people with low back pain. An overview of the literature. Spine 1994;19(11):1214-1222. 28. Maier-Riehle B, Harter M. The effects of back schools--a meta-analysis. Int J Rehabil Res Int Zeitschrift fur Rehabil Rev Int Rech Readapt 2001;24(3):199-206. 30. Hirsch MS, Liebert RM. The physical and psychological experience of pain: the effects of labeling and cold pressor temperature on three pain measures in college women. Pain 1998;77(1):41-48.